In its pursuit of carbon neutrality, Vermont's Middlebury College may have gone too far — supporting a pipeline that would carry fracked natural gas. Middlebury College in Vermont may be a small school, but it has long been recognized as a big leader on the environment. Back in 1965, Middlebury established the nation’s first environmental studies major. More recently, in 2007, the school was among the first to pledge to go carbon neutral. It is also the birthplace of the international climate group 350.org and home to renowned environmentalist Bill McKibben. But despite this clear commitment to protecting the planet, Middlebury College is now supporting a controversial pipeline that would carry fracked natural gas through Vermont and under Lake Champlain to the state of New York. The company behind this project, Vermont Gas, currently operates a network of fracked gas distribution pipelines in northern Vermont that it hopes to connect with national networks in New York. If completed, this project would directly undermine the spirit of the fracking ban in Vermont and threaten New York’s tenuous fracking moratorium. While 70 percent of the gas that would run through the pipeline is promised to International Paper — a private corporation in New York — Vermonters are being forced to foot a significant portion of the pipeline’s cost with only some businesses and homes getting access to the gas it carries. The bigger picture, however, is that dozens of towns along the route will be subjected to commercial disturbance and health and safety risks without any definite economic gains. Money is not the only thing Vermont Gas is taking from the public. The company is also applying to the Vermont Public Service Board for a Certificate of Public Good, which would allow it to use of eminent domain to seize land and force local residents to host the pipeline in their front yards. While the Public Service Board must hold two open hearings, they will not be entertaining concerns like Bolton’s. Public comments are not considered as evidence — only pre-approved intervenors, mostly local businesses and institutions, will be heard. Given this distinction, the board rejected a motion to intervene by Vermont Intergenerational Stewards, a group of youth concerned about climate change. Meanwhile, Middlebury College, which is one of the pre-approved intervenors, has a vested interest in seeing the project completed. Specifically, it wants to use the pipeline to transport bio-methane — a renewable energy derived from cow manure — to its campus from a facility several miles outside of town. Middlebury has already committed $2 million to develop the bio-methane, which it would use when energy demands on campus exceed the capacity of its bio-mass plant. Currently, when that situation arises the school must resort to burning oil. In theory, any turn toward renewable energy is in keeping with Middlebury’s pledge to go carbon neutral. But pipeline opponents have argued otherwise, calling this arrangement a “false solution” because the college has advocated for the expansion of a fracked gas pipeline and publicly endorsed the consumption of fracked gas in Vermont in the process. Furthermore, it is unclear whether Middlebury itself can even avoid burning fracked gas, as it would be a complicated procedure to separate out the bio-methane. With the legal system not hearing these complaints, local residents, landowners and students have instead decided to band together to fight the pipeline head on. Last November, climate activists unfurled a banner in front of the Vermont Gas headquarters. A month later, organizers delivered a Certificate of Public Destruction to Vermont Gas, satirizing the notion of this project being for the public good. In March, members of the community coalition held a rally outside the first Public Service Board hearing. Activists voiced their concerns, making it known that the three political appointees who comprise the board were not acting accountable to the communities affected by the pipeline. Outside the hearing, Middlebury College students explained that despite the letter of support for the pipeline from President Ron Liebowitz, the community of students, staff, faculty and alumni did not agree. Students then launched a petition calling on President Liebowitz to retract his letter of support, garnering over 1,400 signatures within a week. Those organizing against the pipeline are not the only ones wary of carbon offsets. Environmental justice advocates have long discredited this approach as presenting climate change in terms of individualistic morality, where peace of mind can be bought and collective political action is discouraged. As the Indigenous Environmental Network pointed out in a recent statement, carbon offset programs do not consider the health and livelihoods of people living where fossil fuels are extracted, transported, refined and burned because they make carbon the only factor in the equation. “Our lack of a carbon footprint needs to be healing a larger systemic problem, not perpetuating it,” said Middlebury student Sarah Bachman, who organizes on campus and is now living in the town over the summer to work more closely with the wider community. She and many others close to the issue have seen it span across towns and generations in ways they hope will embolden continued broad-based environmental action. For instance, when Middlebury administrators chose to ignore local resident Nate Palmer at a demonstration by walking away as he began to speak, several students proposed he enter the administrative offices with them and make his voice heard. 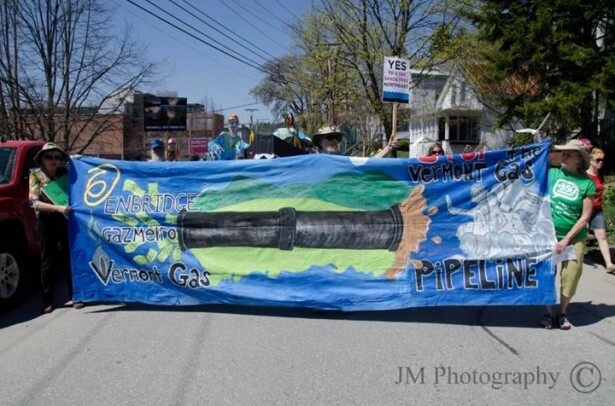 Jay Saper and Anna Shireman-Grabowski are part of the coalition working to stop the Vermont Gas fracked gas pipeline, move beyond false solutions and actualize environmental justice. They received helpful input on this piece from community members involved in this campaign. Jay can be reached at jaysaper[at]gmail.com. Anna at ashiremangrabowski[at]gmail.com. Thank you, Jay and Anna, for your great reportage. As a grad and former professor at an Environmental/Liberal Arts college (Northland, in Ashland, Wisconsin), I know that challenging the administration on environmental grounds is not easy, but every single positive change made at that school while I was there was initiated, pushed, and finally (over the resistance of the administration right up until such time as they made an enlightened switch) implemented by students and a few faculty. Thrash on to victory!